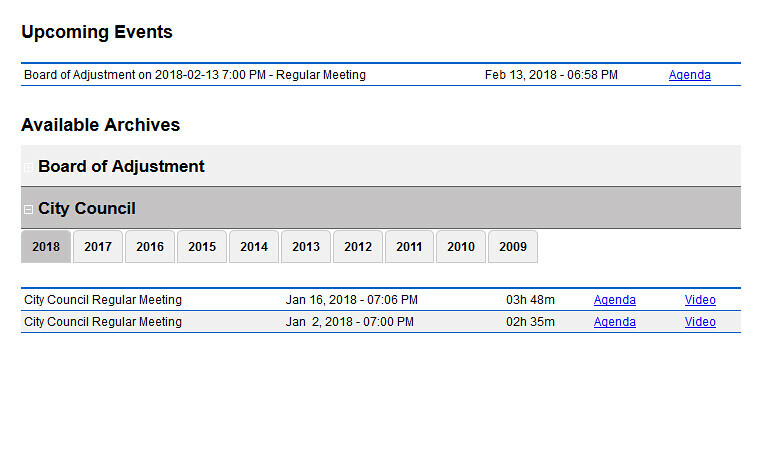 COLUMBIA, Mo 2/7/18 (Beat Byte) -- City of Columbia officials have removed a video recording and PDF agenda of the most explosive City Council meeting in years from both the city website and the online Feb. 5 meeting archive. Council members heard testimony Monday night from two people urging city manager Mike Matthes to resign; and one person demanding 2nd Ward City Councilman Mike Trapp also step down, for violating a city conflict of interest ordinance and Missouri ethics laws. Known as "City Stream," the Council videos form a living library made available both during and immediately after each biweekly Council meeting. 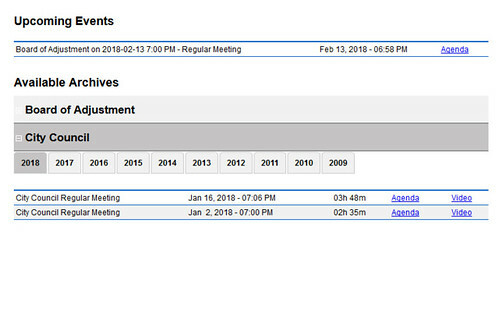 At no time during roughly the past decade have the videos, meeting agendas, or the archives been unavailable (though the Heart Beat has not watched every meeting video). City Clerk Sheela Amin sent an email to Council members offering a DVD for pickup at City Hall. "Shells [Amin] notified us yesterday morning when they tried to view the video that there was a problem," Sixth Ward Councilwoman Betsy Peters emailed this writer after I inquired of the entire Council and city communications director Steve Sapp. "Our city IT department is aware and the vendor is also aware. They are working on getting the entire video available. When it’s available we will let you know." But both the archive and the video were working fine yesterday morning, when this publication transcribed Suzanne Bagby's detailed criticisms of Mr. Matthes' racially-charged presentation before the Columbia Values Diversity Breakfast last month. "I am comfortable asking you today for your resignation, so our city can begin the healing we need to put your ignorance at its end," Bagby told Matthes, looking him in the eye during her entire three-minute Council testimony. "I'm an engaged, uncomfortable black mother and I'm awoke." The racial bias Matthes displayed at the breakfast is "deadly," Mizzou doctoral student Sarah Senff also told the Council, because it creates the impression in law enforcement that black persons are intrinsically tied to drugs, crime, poverty, and powerlessness. Senff asked Council members to "find a city manager prepared to support changes" that would both eliminate the bias and start a long-overdue citywide healing process. "Unfortunately, I am doubtful such healing will come under the leadership of city manager Mike Matthes," she concluded. In the evening's most pointed testimony, Paul Love, who is challenging Mr. Trapp for his Council seat this April, demanded his opponent resign from the Council for failing to abstain from a vote to approve the $2 million Broadway Hotel TIF. Broadway Hotel owner Dave Parmley, a Downtown CID board member, oversees and votes on a $100/hour consulting contract Mr. Trapp recently received from the CID. Mr. Trapp served as the swing vote to approve the TIF, reversing the city TIF Commission, Library Board, and Columbia School Board, all of whom voted against it. Had he abstained, as Love remarked, the TIF would have failed. "I think I explained rather clearly during the meeting why I believe Mr. Trapp's actions constitute violations of both the Missouri Ethics laws and city of Columbia ordinances," Love said on Facebook after learning about the vanishing video. "Excluding issues that may potentially be criminal activities by Mr. Trapp, they [the city website] could also be experiencing technical difficulties." Ms. Peters forwarded the email from Amin offering the DVD. "I am not sure when the issue of the video being available online will be resolved," Amin explained. "Staff is still working on the issue, and has made DVDs available for pick up at the Information Desk this morning for anyone needing to view the video before the issue is resolved."